Freedom News: Fair Use is a Right! 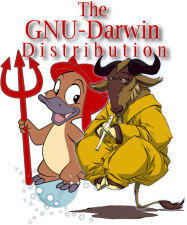 GNU-Darwin is an activist free software distribution, and we will continue to be engaged on many fronts for the benefit of our users. For breaking freedom news, try our Freedom News RSS channel which is also shown to the right, or the GNU-Darwin Monster News, an aggregator which is updated hourly. If you are i nterested in archived links, try the old freedom news page. We will continue to archive crucial stories there.